Battery fires linked to Samsung’s latest flagship Galaxy Note 7 has led to a major fallout in the smartphone market. “This incident exposes Samsung’s flawed strategy of allocating most of its smartphone battery orders to Samsung SDI,” said Duff Lu, research manager of EnergyTrend, division of TrendForce. The battery defect in Note 7 will have limited short-term impact on the lithium battery industry as a whole because just that one device model is being affected. On the other hand, the incident in the long run will cause smartphone brands to rethink their strategies for battery supply chains. Most smartphones and notebooks use lithium polymer batteries because they are lighter and thinner compared with other types of lithium batteries. The percentage of smartphones using polymer batteries has risen considerably since 2014 as the competition among device vendors becomes fiercer and a polymer battery supply chain has emerged in China. The increasing adoption of polymer batteries has also led to a significant reduction in the use of prismatic lithium batteries among smartphones. 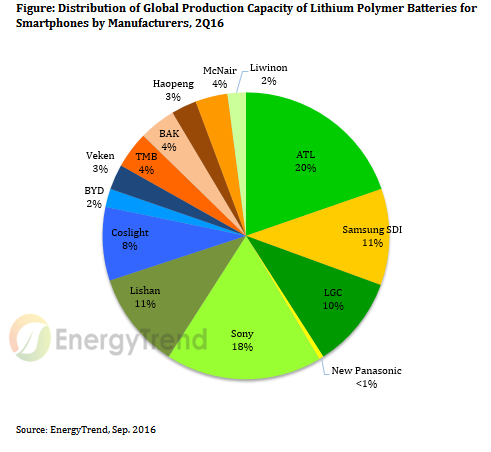 EnergyTrend’s data shows that the share of smartphones using lithium polymer batteries has soared from around 35% in 2011 to 70% in 2016. According Lu, Hong Kong-based Amperex Technology (ATL) is currently the leading lithium battery supplier worldwide in terms of production capacity, followed by Sony, Samsung SDI, LG Chem (LGC) and Lishan rounding out the top five. ATL has been the most active in capacity expansion in recent years, though other China-based suppliers have continued to take on more capacities as well. South Korean battery makers by contrast will only increase their capacities if there is stable demand growth. Conversely, Samsung gave more than 60% of its Note 7 battery orders to Samsung SDI. By doing so, Samsung found itself with very few options as it faces problems with product quality and safety. In the short term, Samsung will be under pressure to find alternative suppliers and rebuild its damaged reputation. The incident’s impacts on the wider lithium battery industry, however, is not as significant. In the long run, Samsung will focus on diversifying its battery supply chain. The incident also serves as a warning to other smartphone brands that they will have accept tradeoff between energy density and component cost when choosing their batteries.